We love this AP graph so much we can't stop reading it. Here ya go: On a day when coach Pat Riley deactivated two forwards whose body fat readings aren't within team parameters, then began an indefinite leave of absence because of knee and hip problems, the defending NBA champions continued their free-fall. This truly is a gorgeous year to be a Heat fan. 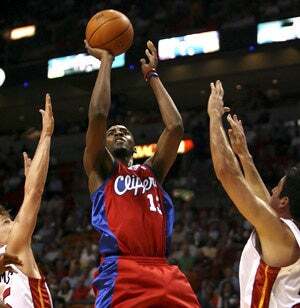 Clippers 110, Heat 95. Miami forwards Antoine Walker and James Posey were the offending tubbies, in case you're wondering (we're just glad that they don't have a similar policy here). • Gilbert Loves The Leather. Agent Zero, is there anything you can't do? Gilbert Arenas' 32-foot jumper just before the buzzer gave the Wizards a 108-105 win over the Bucks. • Everybody Loves Tony. Question: Memphis Grizzlies interim coach Tony Barone ... does that rhyme? Doesn't matter; he's doing something magical with that offense, as the Grizzlies scored 144 points in regulation in a 144-135 win over Golden State. Pau Gasol had 24 points and 13 rebounds. • The Amazing Adventures Of Captain Canada. So it's the beginning of the fourth quarter, and Steve Nash is thinking 'It's my first game of the season in Canada, and I've got two points? What's up with that?' Nash went on to score 13 more as the Suns beat the Raptors 100-98. Nash scored eight of Phoenix's final nine points.